There was a question on the Mantic Forum recently regarding the "Regroup'" rule. Regroup occurs after Melee where one unit has been able to rout its opponent. 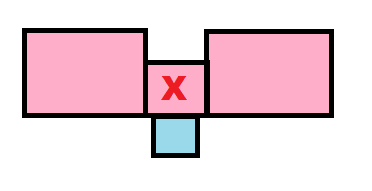 stay where it is and pivot around its centre to face any direction (as per a Change Facing order). move directly forward D6". The unit must move the full distance This move is not affected by difficult terrain and obstacles. move directly backwards D3" (as above). A unit cannot move through any other units while regrouping, though it can pivot through them as long as it ends clear. A Hero on a 40mm square base (blue) has been able to rout its opponent on a 50mm square base - Pink (maybe a Monster, more likely a War Engine). The victorious Hero is within 1" of both non-combatant units. Previously I had thought that he would be unable to advance D6'' or pivot as both moves would effectively breach the 1" rule by moving within 1" of enemies. My reading of the rules was that that was only possible when Charging. As a result I thought its only options were to move back D3" or do nothing. The hero can carry out all three moves. The 1" gap is only applied after the moves have been carried out. As indicated, this was news to me and I suspect it will be to a number of other players. Certainly it impacts most games that you would play.